Proin is a prescription, liver-flavored chewable tablet, intended to manage urinary incontinence in dogs and cats, by constricting and strengthening the urinary sphincter. 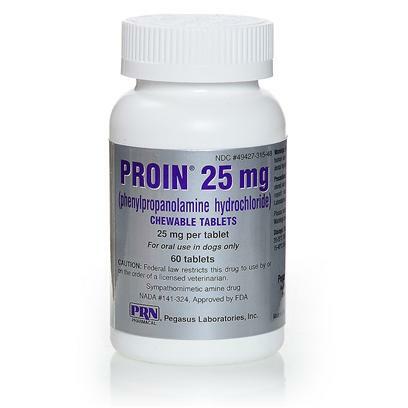 Proin is a supplemental adrenergic agent, which means it mimics adrenaline or epinephrine, which are the hormones needed to trigger vasoconstriction, the constriction of blood vessels. Do not give with ephedrine or epinephrine, or within two weeks of using a MAOi, such as Anipryl, selegiline or a Preventic Collar. Proin may cause restlessness and hyperactivity, pale gums, difficulty urinating, irritability, hypertension, and decreased appetite. Hypertension risk increases if Proin is given concurrently with non-steroidal anti-inflammatory drugs (NSAIDs), or with reserpine, tricyclic antidepressants, amitraz (the active ingredient of the Preventic tick control collar and canine Promeris, a flea control product), or ganglionic blocking agents. Conditions such as glaucoma, prostatic hypertrophy, hypertension, hyperthyroidism, diabetes mellitus, and cardiovascular disorders, may worsen. Side effects may worsen if used in conjunction with other sympathomimetic drugs such as ephedrine or epinephrine. Notify your veterinarian of any medications, treatments or vitamins your dog is taking, prior to administering Proin. Administer Proin chewable tablets, to the exact specifications of your veterinarian, and with food. Dogs All Weights Tablets: The usual dose for dogs is 0.4-0.8mg/pound every 12 hours. Drops: 0.4-0.8mg/pound every 12 hours.